In “The Miracle of MAN-i-festing the Ultimate Love Relationship” Mamiko Odegard, PhD illuminates many fear-based beliefs and conventions, each of which undermines healthy love and ultimately leads to suffering and tragedy in our relationships. This chapter in Miracles, Momentum and Manifestation picks up where Daily Affirmations for Love left off… Mamiko Odegard builds on many of the principles found in her first best-selling book. Here she explores, at a deeper level how to shift from “wishing and hoping” to using a tried and true blueprint to “MAN-ifest” the kind of love, respect, and devotion you deeply crave. If you’re ready to go for the gold, then read on, and build some momentum in your quest for an ultimate LOVE relationship. Accessible and practical, Dr. Mamiko’s wisdom invites you to look at your own life and see how MAN-i-festing a quality relationship can shift your relationship to one where you more quickly claim your true desires by cultivating a deeper awareness, detaching from unhealthy beliefs, and ultimately… discovering your true self. 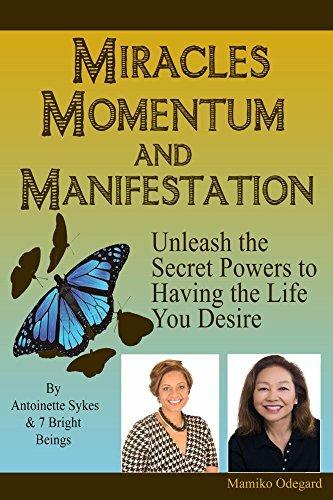 Throughout “Miracles, Momentum and Manifestations” stellar writers contribute their journey to find each… with an underlying message of hope that defines when life happens or YOU can happen to life! In this anthology, eight authors share super successful Miracles and Manifestation concepts as dynamic and transformational experts – all leading to a better place in what we call an intentional LIFE!